Under the slogan “Our World, Our Dignity, Our Future” the year 2015 has been declared as the European Year for Development (2015EYD). The aim of the EYD2015 is to raise the awareness of European citizens for the interconnectedness of our world. Today, what happens in Europe has a direct influence on countries in Asia, Africa or Latin America and the other way around. In this context of globalisation, European citizens need to be involved in and sensitised about global challenges, such as poverty eradication, food security, climate change, democratic societies and gender equality. 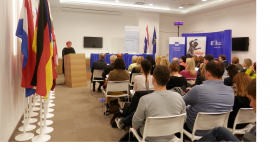 This conference was organised in the framework of the EYD2015 by the European Network of Political Foundations (ENoP) together with its Croatian member organisations Novo Društvo, Medunarodni Edukacijski Centar and Zaklada Hrvatskog Državnog Zavjeta. It aimed to bringing in the Croatian perspective on EU Development Cooperation and discussing the challenges linked to it together with Croatian experts and civil society representatives. Panel 1: European Development Cooperation – Global challenges need global answers! Background on EYD2015: Under the slogan “Our World, Our Dignity, Our Future” the year 2015 has been declared as the European Year for Development (2015EYD). The aim of the EYD2015 is to raise the awareness of European citizens for the interconnectedness of our world. Today, what happens in Europe has a direct influence on countries in Asia, Africa or Latin America and the other way around. In this context of globalisation, European citizens need to be involved in and sensitised about global challenges, such as poverty eradication, food security, climate change, democratic societies and gender equality. Background information: Being the world’s largest donor of development assistance, the European Union cooperates with partner-countries to build peace, democratic societies and respect for human rights. As a new member of the EU family, Croatia has shown commitment to contributing to the development assistance goals. To inform and engage EU citizens a strong and comprehensive narrative which underlines the universality of the challenges, we are facing and the solidarity and responsibility is needed. How can new EU Member States like Croatia and its civil society contribute to this new narrative during and after the EYD? The conference started with a short introduction session by Karolina Leakvoić, Novo Drustvo. She presented to the audience the scope of work of ENoP and stressed the importance of the conference tackling development cooperation, especially in the Croatian context, as Croatia being a new EU member-state (MS). Lekaović also referred to the second conference panel which tackles the relation and implications of development cooperation policies on migration. The speakers outlined the importance of official development assistance provided by the EU, as well as the need to keep the EU as a major development donor. However, they also stressed that some EU MS, especially the new ones, like Croatia, do not have sufficient financial potential to contribute to the same amount as to which the older/richer MS can do. It has been estimated that new EU MS should invest 0,33% in development. However, Croatia has only managed to invest 0,13% last year, but it is still a big achievement for the country compared to before its accession (when its contribution has been 3 times less). The ODA goal of 0,7% should not be equally applied to old and new MSs. New MS should have a lower threshold for contributions. The focus should not always be based on financial contributions, but also on experience. Croatia can contribute a lot to development with its transitional experience. Focus could be on transfer on knowledge, learning how to manage refugees and displaced persons. Peaceful reintegration experience of Croatia will be very valuable. Croatia is also the only country in addition to Slovenia that has traditionally cooperated with developing countries before its accession to the EU. In addition, it is of the utmost importance to strengthen the strand of gender equality, also envisaged by the MDGs. During the war in Croatia 80% of the refugees had been women and elderly people. In conflicts and wars, refugees are mainly women and children. In this regard, Croatia has a good experience in helping women in their psycho-sociological recovery. This could be a very beneficial experience to developing countries and counties dealing with refugees. CS should play an active role in foreign policy. It should help shape EU development policies. In addition, migration can also be divided into: short-term and multi-stage migration, as well as ethnical migration (which is not tackled within the EU programme documents). In Croatia all the above mentioned types of migration have been and are faced today. Today we are witnessing crisis in countries like Ukraine and Syria which is the main cause of ethnically motivated migration. EU is the first target for most migrants. Croatia in this regard can offer a lot in terms of experience. In the 90s Croatia had only 0,5% of foreigners living in the country, based on the country’s estimation, however the % calculated by the international community amounted to 70,5%. Where does this discrepancy come from? It comes from acknowledging the right to citizenship. For example, Croatians living abroad in Bosnia and Herzegovina were not seen as migrants and vice versa. Within Yugoslavia and following its collapse, the notion of migration was different than in the rest of Europe. The other category of migrants that Croatia has faced is from ‘’outside’’, or the so called classical migration. With joining the EU Croatia has been confronted with a new dimension of migration, deriving from the fact that the country borders expanded and new categories of EU citizens were eligible to freely migrate in the country. Having this various migration experience, the panelist have stressed that Croatia can help the EU tackling the issue in different aspects. In terms of development cooperation and migration, there should be a distinction between forced migration and financial migration. A difference between those migrants who should be protected and who leave the countries because they fear their lives, and those illegal migrants in order to improve their living standards. EU has to deal with illegal migration. MS have to work together to return these migrants in their origin countries and safety has to be provided. The panelists stressed that in Croatia there is still only a selective and marginal discussion on migration. In the past years EU policies towards illegal migrants have not been in line with human values and rights. Policies of exclusion have been a practice. How can Syrian refugees be seen as illegal migrants? They should have a status of asylum seekers and not be put in detention centers. There are incidents where people are mistreated, many lose their lives which is where the criticism for these policies stems from. Security policy budget for FRONTEX has increased from 2005 from 6,3 mln to more than 80 mln. The proclaimed austerity measures are valid for all other sectors, but this one. Since its accession to EU the number of asylum seekers has decreased 3 times for Croatia. What is the reason for that? The Dublin regulation is responsible. Asylum-seekers first reach Greece and Italy and they need to stay in these countries based on the Dublin regulation. In terms of migrant integration, it is still difficult for Croatia to manage it due to several factors such as: religious practice; the right to enter university – no quota for immigrants; the lack of integration policy; the policy of fear – the prejudices against migrants – who are they, what diseases can they bring;,etc. Humanitarian policies EU and Croatia need to regulate the issue of protection of migrants. Revision of the Dublin convention – burden-sharing of the migration influx between the EU member-states is essential! The fundamental problem about migration is that it is usually not managed well and there is no coherent policy related to it. We should perhaps look at positive examples of countries like the USA where the country is built based on migrants, and try to look at the added value of it, and the incentive for development, rather than as a threat to European security.